pictured bottom right with Vacaville, Calif., Local 1245's class of 2017 organizing stewards, some of who began their activism after their orientations. There’s an old adage that you only have one chance to make a good first impression. It’s also critical to orienting – and organizing – new members into the union. Orienting new hires as early as possible is one of eight best practices from a new report by Jobs with Justice, a workers’ rights organization, and Pennsylvania State University. The guide, “Making the Case for Union Membership: The Strategic Value of New Hire Orientations,” found that orientations can increase new member sign-ups and bolster commitment to the union – commitment that translates to more members fighting for their union. No one is a blank slate when it comes to unions, cautioned the report, which was drawn in part from a survey of 49 unions and interviews with labor officials involved with new member orientations. People have heard about unions and they may harbor negative opinions. Orientations provide an opportunity to change that narrative. And the first thing they hear should be positive, Sauceda and Juarez said. 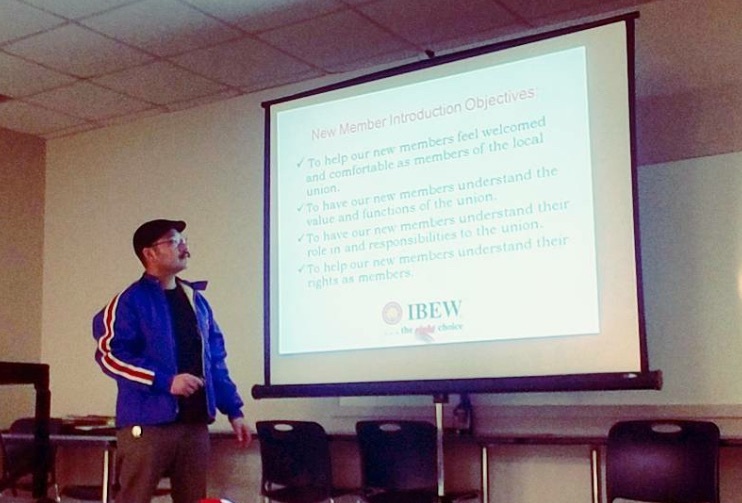 Houston Local 716 Organizer Jorge Martinez conducts a new member orientation before the monthly union meeting where the new members were then sworn in. “It’s your chance to say, ‘Welcome to the IBEW, here’s my number if you need anything,’” Sauceda said. Juarez said she made the orientations she did as an organizer with Vacaville, Calif., Local 1245 interactive, another best practice: Make sure the training is high quality, engaging and useful. One tactic involved creating a scavenger hunt with the contract so members had to open it up and look through it. When he was an organizer with Houston Local 716, Sauceda said he made sure to tell people about the cyclical nature of construction and that, when business was slow, they still had opportunities to work, whether by traveling or working for the union in some capacity. Juarez and Sauceda also gave members handouts and branded items like stickers and shirts, another best practice: present information in different ways and hand out free swag to cultivate identity with the union. The report also stressed the importance of intentionally selecting facilitators. Leaders should consider factors like race, gender and age when deciding who will run the orientation. Consciously or not, new hires will decide if they can see themselves in the union when they look at who’s at the front of the room, the report cautioned. In Houston, a vast majority of the construction workers are Latino. Having Latino people on staff, for orientations and for walking the job sites, was vital, Sauceda said. “We wanted the IBEW leadership to be what they looked like,” said Sauceda. Both Juarez and Sauceda said that conducting new orientations correlated with a significant increase in engaged membership. Juarez said she got more organizing stewards. Sauceda said his local had higher turnout at community events, and that those often translated to more members willing to engage in union activism. “If you can get someone to go to one volunteer event, they’re hooked,” Sauceda said. For locals unsure about orientations, whether because of the time commitment or money, Sauceda said the International Office is here to help. Besides, having an engaged membership means more people pitching in for the local.